Q. I cannot search Web of Science using Internet Explorer - there is no search button! If you have Internet Explorer 8 or above but you find the search button is missing, it could be that your browser's compatability view setting is on. This means Internet Explorer will identify itself as IE7 and pages may be displayed as if you have an older browser so that elements on the page, like buttons, may be missing, or not function correctly. 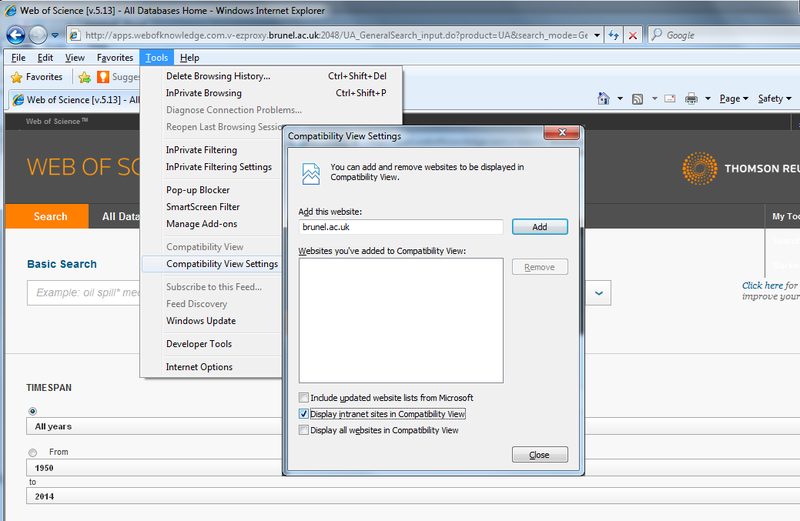 The reason compatability view is used is to ensure older, web-based applications, designed for IE6 or IE7, still work. If you are using IE9, this browser should work by default. however, if you have toggled the "Compatability View" button on the right hand side of the URL address bar then you will get the same problem. To fix it click on the "Compatability View" icon once more.